Mr. Holt tells Martha Berry that he is sending his yearly donation in honor of Mrs. Holt's recovery from a dangerous operation. He then says that he hopes to bring Mrs. Holt to Berry soon. He recalls being at Berry on Mother's Day in 1923 and says that he ordered an autographed book to be sent to Berry before Mother's Day. He suggests that the author of the book should visit Berry for inspiration. 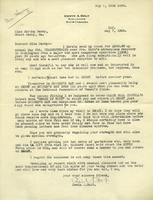 Mr. Holt hopes to send some quotations to Berry soon and regrets that he cannot send more money. 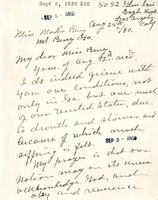 M. Emma Mehard writes to Martha Berry about the poor situation facing much of the country. She hopes that the nation will reconnect to God. She sends a $50 donation to help a worthy child.